Photo courtesy of Tony Huynh. 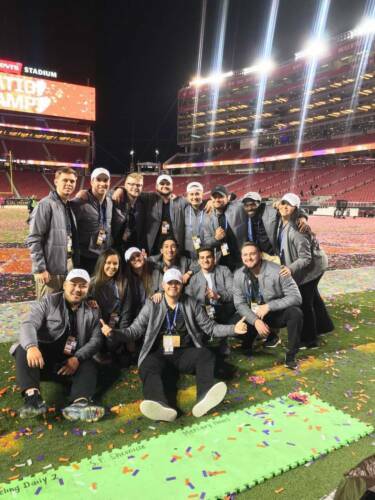 Looking up at the brilliant display over Levi’s Stadium in San Francisco at the 2019 National Championship Game this past January was Mizzou senior Tony Huynh, who had been working for the event as a graphic designer over the past year. Huynh, a parks, recreation and sport major who will be graduating in May, has become known throughout the sports industry for his design work. Growing up in inner-city St. Louis, Tony attended a small high school where, according to Tony, no parents had gone to college. “Money is really a tight issue there,” he says. “It was the teachers and students, that connection that we had, that really kept things together.” While he was not a stranger to making art, it wasn’t until his senior year of high school that he started creating sports graphics, originally, just for the fun of it. As he continued to make his graphics, adding his own artistic flair and creativity to images of athletes and sports iconography, he says he dreamed about what it would be like to work for a professional team and began to take the work more seriously, eventually realizing that design was something he wanted to continue through higher education. “This is something I really want to pursue because I believe I have a future in it,” Tony says he told himself. And so Tony came to the University of Missouri, becoming a first-generation college student in the process. With the wealth of new perspectives around him, the transition from the inner-city to Mizzou was “a huge culture shock,” Tony says. While he originally intended to focus solely on graphic design, Tony realized early on that “I didn’t like marketing at all.” So he changed his major to parks, recreation and sport, with an emphasis on sports management. “You don’t typically see a graphic design student in a sport management program,” he says. But it was a decision that ended up taking him across the country to see the inner workings of the sports world, as well as making connections within the industry. 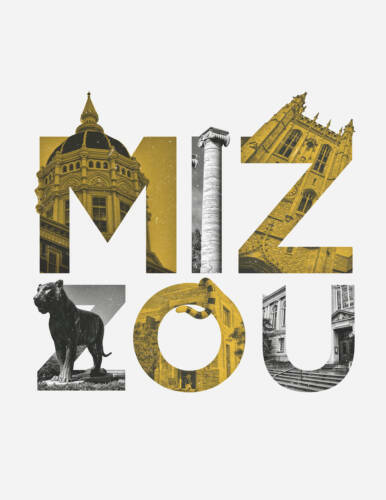 In 2016 he started doing graphic design professionally as an intern with Mizzou athletics, and over time has built up his portfolio and began to make himself known within the sports industry – mostly through social media. “Twitter has been such a great platform for me because it allowed me to branch out and to get to know a whole bunch of people who are also sport designers,” Tony says. One day, Tony received a twitter message asking if he would like to work for “us” on game days making graphics for social media. The “us” was the Carolina Panthers. 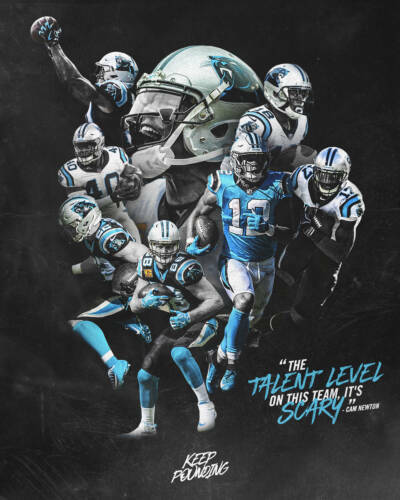 With the Panthers having more than 3 million followers on Twitter, working for the organization, which gave him full creative freedom, allowed for Tony’s work to be seen by even more people. It was also through Twitter that he got asked to do similar work for the College Football Playoff National Championship, an offer that included being flown out for the game. However, Tony didn’t really know just what he had got himself into for the next 3-4 months. While working remotely from Columbia, his responsibilities included making graphics for the game’s social media page. On top of that, he was still working with the Carolina Panthers and Mizzou athletics, and was still a full-time student. But with the help of his bosses and time management, Tony was able to balance it, although he did have his moments of weakness. In January, one of Tony’s rewards finally came, and he was flown out to San Francisco to attend the game, as well as finally meet the bosses he had been talking with on the phone for the last few months. And recently, his hard work paid off once again, as after graduation, the high school student making graphics for fun and imagining what it’d be like to work for a professional team will be heading to Florida to begin his job as a full-time graphic designer for the Orlando Magic. Being a first-generation college student “helped me wake up in a way,” Tony says. “It’s been a great and humbling experience.” While he hopes to one day work as a creative director, at the moment Tony hopes to graduate and “empower and represent minorities working in the sports field.” For Tony, one point of pride in being a first-generation student is thinking about those who go on to higher education after him and knowing he’s “the stepping stone to that.” And for other first-generation students like him, Tony recommends taking the approach that he has.